The first thing I notice as we walk along the beach are the many Ganesha statues that are scattered along the beach. These are the statues that were immersed on auspicious days 1, 3, 5, 7 and 9. They have washed back on shore with lost limbs. The heavier ones are half buried in craters—treasures sunken in the sand. Sometimes we see a lonely ear, hand, or trunk. Who is Ganesha? He is the elephant god. He is the god of new beginnings and the remover of obstacles. He is my favorite god. He was a mischievous child. 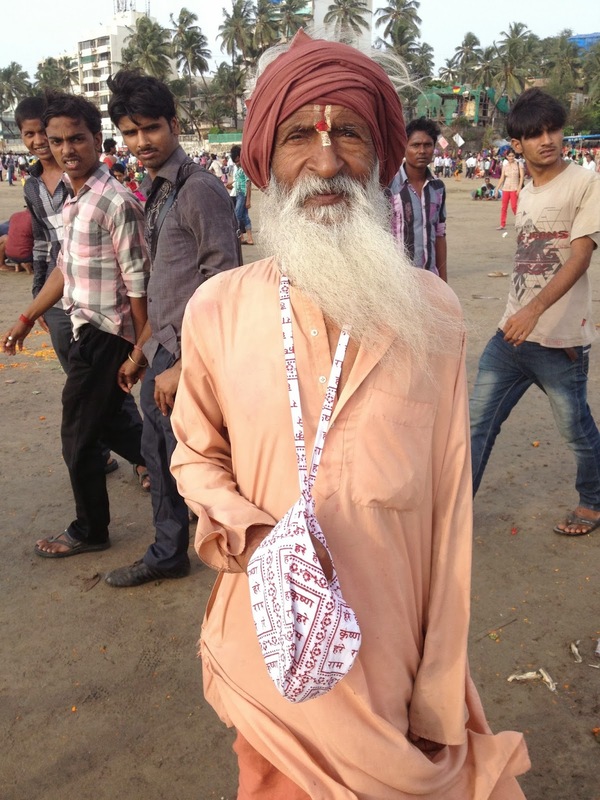 He is affectionately called Ganapati Bapa. He’s the kind of god you meet and you like him right away. You want to invite him to a party and get to know him better. I think he must enjoy this festival very much because it is one big citywide party. Tim and I hear chanting. 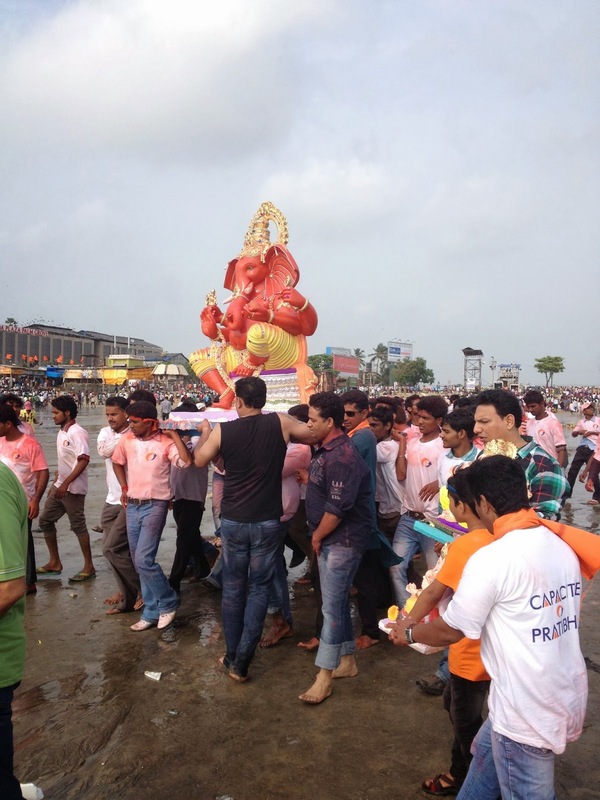 Families are bringing their Ganapati (Ganesha) statues to the beach to be immersed. The families are kind and open. They welcome our curious stares. The Ganapatis are adorned with strings of bright beads, pearls, greenery, and flowers. One family invites us into their worship. The dia (a small lamp with ghee) is lit and burning incense is waved as the family says puja (prayers.) Puffed rice treats with sticky peanut brittle is offered. Tim eats his and I slyly slip him my handful. Next we are offered the bananas that were laid before Ganesha. 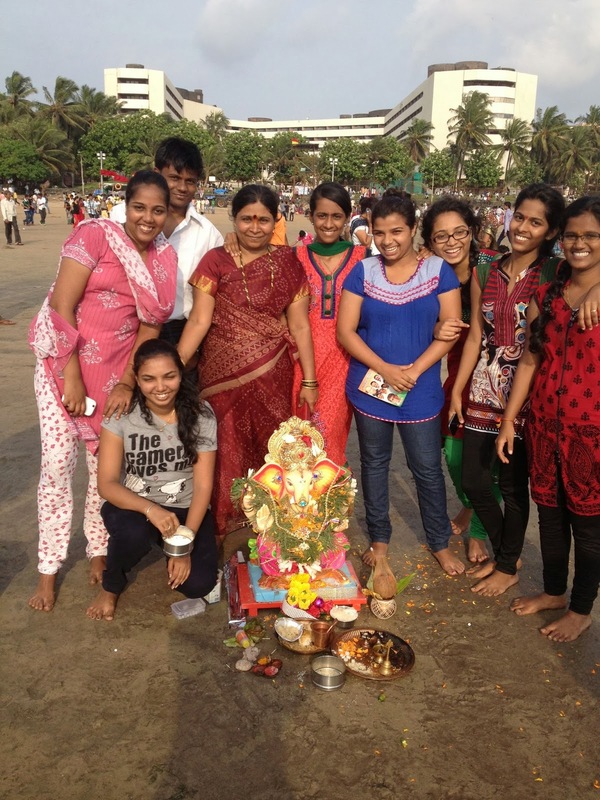 The women lovingly remove the ornaments from Ganesha, the men pick him up, and they head for the water. 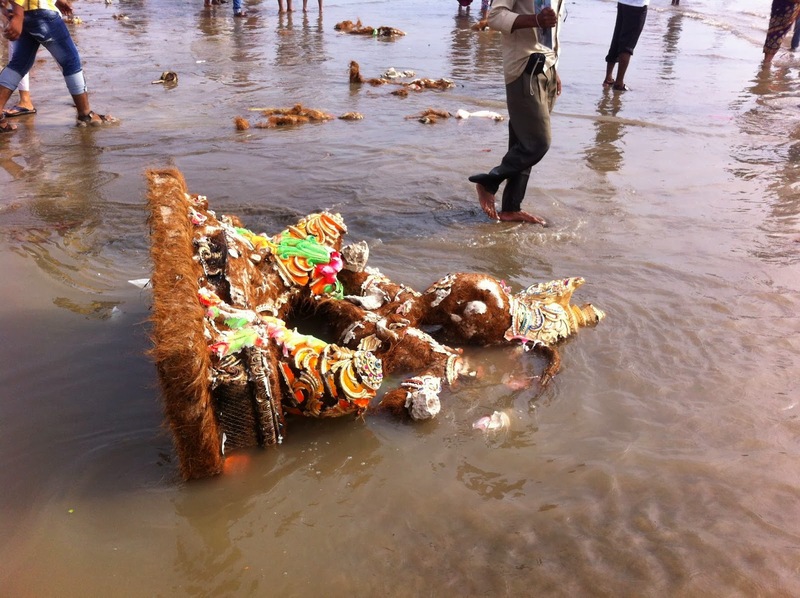 They all go into the water with Ganesha, but the men go farther out. 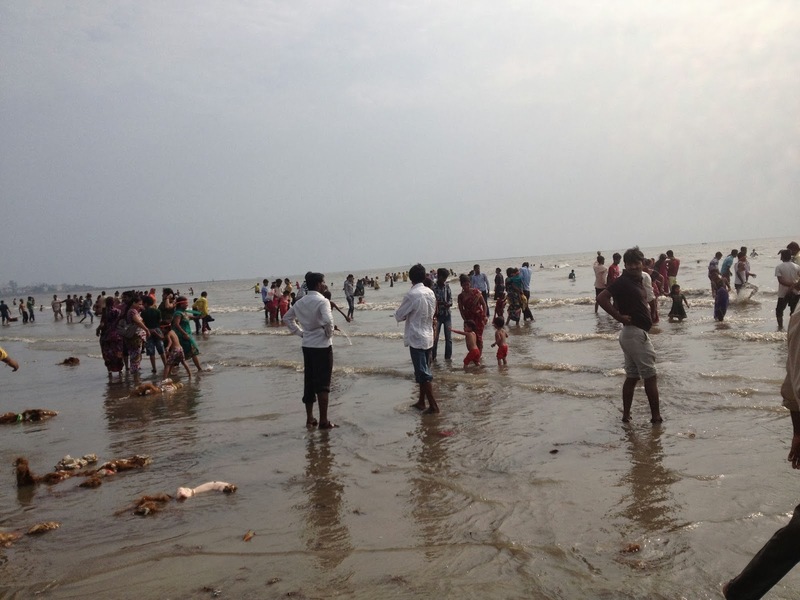 When they reach chest high, they dip Ganesha three times and on the third dip, they push him out to sea—released into the water. More statues are arriving. These statues are larger. They are carried by groups of loud, raucous men. The men are wearing t-shirts stained with red powder. One man shouts “Ganapati Bapa!” The crowd shouts in reply, “Moria!” We join in. “Moria!” we shout with enthusiasm as the chant begins with “Ganapati Bapa!” This statue is 7 feet high. The men are weighed down by its massive orange body, but it does not dampen their spirits. They are honoring Ganesha with their enthusiasm and volume. By 7:00, Tim and I decide it is time to go home. The beach is getting more and more crowded. The mood is changing from a family atmosphere to Mardi Gras. The road we came on has been changed from a two way street into one way towards the beach. Huge lorries carrying even bigger Ganapati statues, plus men and boys sitting, standing, hanging on are lumbering towards the beach. Something hits my face. It stings. It is only flowers, but they were thrown with force. It is time to go home. Tim starts walking with purpose. He is parting the Red Sea of people by the size of his body. We become separated. I try to push forward too. I look anxiously for Tim. How did he get to the other side of the street? I shout for him to stop, but he doesn’t hear me. Finally, he stops and looks for me. When I reach him, I cling to his backpack like a little child. We find a lighted corner near a policeman and wait for Rakesh to find us. When we see his car, we dive into the coolness, safety, and peace. Our tiny capsule of calm crawls forward. People walking, motorcycles, trucks are inches from my face. I watch them through the glass. I see a truck that is decorated with palm branches. My mind wanders . . . Palm branches in a parade. A ride to Jerusalem with a chorus of “Hallelujah!” and people waving palm branches. A ride to the beach on lorries decorated with palm branches with a chorus of “Moria!” Baptism— immersion in water. A symbol of new life. Ganesh Chaturthi— a festival with immersion. A symbol of creation and rebirth. All around the world hymns are sung, prayers are said, and holy people are present. Ganapati Bapa moria!